Nadine Kaslow brings her training as both a psychologist and a dancer to her position as the Atlanta Ballet's first resident psychologist. Photography by Ann Borden. For years, Nadine Kaslow kept her dancing a secret from professors and academic colleagues, fearful they would take her less seriously as a scholar if they knew. As a fast-track science student at the University of Pennsylvania, she took daily ballet classes and taught in the university’s dance program. During her doctoral studies at the University of Houston, she was invited to join the Houston Ballet. No audition necessary, the director said—he had seen her dance—but she had to lose 15 pounds, a loss that would have left her, at almost 5’ tall, more than 30 pounds lighter than ideal body weight. Later while building her psychology career on the faculty at Yale, she continued ballet classes. And later still as a professor of psychiatry and behavioral sciences at Emory—where she directs the postdoctoral fellowship program in professional psychology and serves as chief psychologist at Grady Hospital—she enrolled in demanding classes at the Atlanta Ballet’s Centre for Dance Education. There she met Centre Director Sharon Story and Atlanta Ballet Artistic Director John McFall. Soon after, Kaslow was named the Atlanta Ballet’s first resident psychologist. There is no job description. But in consultations and therapy sessions, Kaslow tackles psychological issues faced by the dancers. She also works with parents of younger students and with McFall and Story on employment issues that involve psychological factors. It’s a broad turf that she understands well. "Dancers are incredible athletes," says Kaslow, "and they face many of the same psychological issues that can interfere with any athlete’s performance—for example, anxiety, injury, or excess competitiveness." But ballet has its special demons, in part because it is an art in which the dancer’s body is the instrument, finely tuned and incredibly visible. 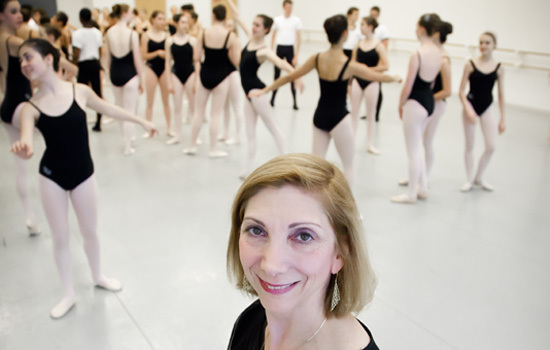 "Ballet breeds perfectionism," says Kaslow. A little can be good; too much and dancers become so focused on technique, expectations, and mistakes that they can’t enter the flow of the dance itself. Kaslow tries to lead dancers away from a quest for perfectionism toward one for excellence. For many, perfectionism involves fretting about the body. The classic, streamlined ballet body is long-limbed, flat-chested, and lean. Very lean. The Atlanta Ballet’s nutritionist, Emily Harrison, also a former dancer, helps members of the troupe understand nutrition and deal with their sometimes love/hate relationship with food. For her part, Kaslow helps the dancers deal with guilt associated with food. Body image issues, prevalent in the larger society, start early in ballet, so Kaslow frequently discusses the subject with parents of pre-professional students. Another issue that begins at an early age: balancing dance with friendships and activities off stage. And a big issue that football players don’t have to face? Many young male dancers have to decide either how to come out to family and friends if they are gay or, even more challenging, how to deal with the constant assumption that they are gay when they aren’t. The tight-knit ballet company members in Atlanta and elsewhere have their share of romantic entanglements, too, all with the usual potential for psychological fallout but with an extra twist. How do you dance an intimate, highly sexualized pas de deux with a former romantic partner with whom you don’t want to exchange glances, much less publically intertwine? Professional dancers also have to think about life after ballet—and soon. Most ballet careers end when dancers approach their late 30s. What makes it worse emotionally as well as practically, says Kaslow, is how little most dancers make, how hard even successful dance companies struggle financially. Today, Kaslow no longer worries how others see her dual life of psychologist and ballerina. She encourages friends and patients alike to find a way to keep their passions alive in their lives.